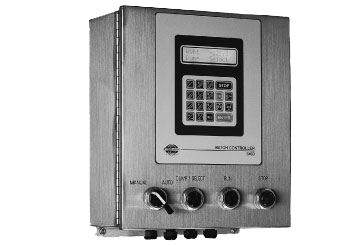 The 5400 can operate as a Micro Batch Controller or a Ratio Metric Batcher. As a Micro Batch Controller, operators can batch multiple ingredients automatically or use the manual control buttons. Up to 200 formulas and 24 ingredients can be stored. Individual ingredient totals and a summary of formula totals can be displayed and printed. Programmed relay functions are easily connected to solenoids, switches and valves, allowing total control of the relay functions. Each menu selection setup, configuration, calibration, alarm or supervisor mode can be protected to prevent unauthorized changes to programmable parameters.